There are two bands which I have the most interest in talking on. This greatly shaped what equipment I decided to buy. The two bands are 2m, and 75m. For the time being, I'm located only on the 2m, but I have my eye opened for the 75m some day. How did I pick these two? Let me take it one at a time. Two meter seems to be the single best band to start with. No doubt I'll have people dispute that, but let me explain a bit. First of all, there are a multitude of 2m repeaters out there. Repeaters have a couple of nice effects. First of all, they allow you to talk with people further away than you normally could. If you can make the connection to a repeater, then anyone who can connect to that repeater can talk to you. This tends to allow you to talk to anyone in a metropolitan area. From my brief exposure thus far, I have heard people from as far as 30 miles away, and I'm barely started! The other nice thing about repeaters is they give a single frequency that you can go to and meet people. Put in a few key near-by repeaters, and you'll never lack people to talk to! 75m is a bit harder to explain, but I'll give it a shot. This frequency allows you to talk distance occasionally, but more than that, it allows you to talk well to people who you could actually drive to in a few hours, if you really wanted to. 75/80m seems to be a very common frequency for use in disaster relief, because of this characteristic. I'm also interested in 20m, and a few others. But I really just don't have a lot of knowledge of high frequency, so I'm starting out slow and working my way into it. 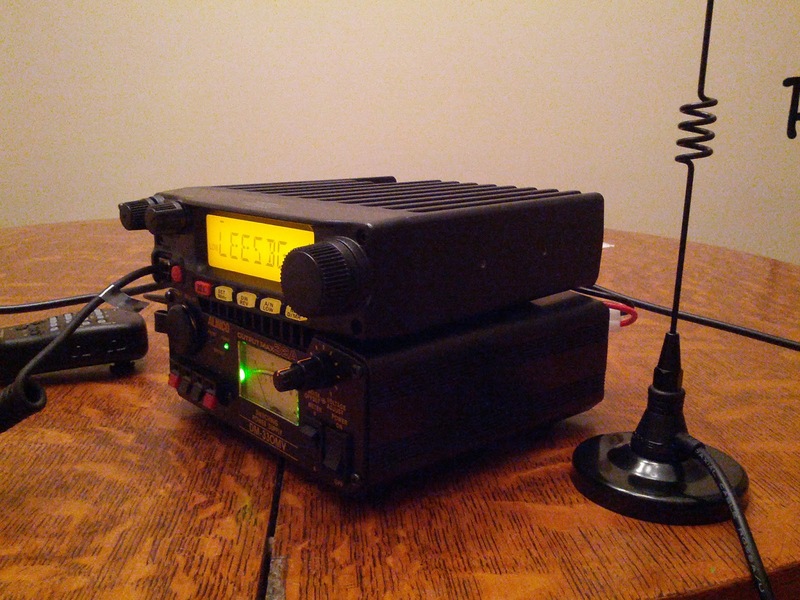 Besides, the cost for a HF transceiver is much higher than a 2m rig, and there's really no big hurry. So, what did I end up getting? Well, I decided to just start out with 2m, with an eye towards the future. I bought a Yeasu FT2900R transceiver, a C*MET M-24M magnetic mount 2m/70cm antenna, and an Alinco DM-330MV power supply. The power supply was somewhat more than I really need now, but it will last me for some time to come. The radio seems to work well for me for now, I've been able to do fine. Having an indoor antenna is definitely causing me some issues, but it seems to work well enough for me for now. I have all the power I will ever really need on the 2m band, so I'm content for the time being. I can recommend this setup, most especially the transceiver, to whomever might be interested in buying their own gear.